Practice makes perfect with our Callaway HX Golf Practice Balls! Get yours in lime, orange, or pink! It’s also available in a 9 pack or 18 pack. 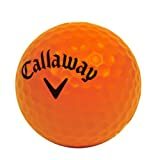 The bright colors help keep track of your ball once hit. Unique patented HEX dimple pattern simulates actual ball flight at reduced distances. Durable foam construction and soft flight design make these safe to use anywhere! Don’t worry about damaging your clubs or ruining any property. It includes a strong and durable mesh bag for easy storage and portability.